Ever since my medical tests last week, I’ve been visited by a vague and unsettled feeling. A restlessness of a sort. It’s a feeling that something’s changed even though, technically, nothing has. It’s not physical. Physically? I’m great. In fact, I’m better-than-great. I mean, what a gift to know (as the cardiologist said) my arteries are “as clear as the day you were born.” Didn’t know that before last week. Now I do. That’s a gift. It’s definitely spiritual. Psychological. Deep-level stuff. A kind of a brooding feeling, almost. It’s like I was on a bus, and the bus was going along just fine. When, out of nowhere, somebody jumps up and pulls the emergency brake. The alarms screams. The bus lurches to a stop. You’re thrown forward, headfirst into the seat in front of you. Then, you’re yanked back the other direction, as the bus shutters and shakes to a complete stop. You hear the exhale-sigh of brakes loosening again. And, in a matter of seconds, the bus is headed back down the road, just like nothing ever happened. But, something did happen. And even after you’re underway again, there’s an adrenalin surging through your veins. A looking-back over your shoulder. Which reminds me of the time our dogs cornered a possum on the back porch. It sounds like something that might happen out in the country, but it was right smack dab in the middle of North Dallas. One night, we were awakened by our small dog, Scruffy, barking his little head off. We looked out on the porch, and there was our other dog, Grace, nose to the ground, eyes focused ahead on the prize…a possum that had wandered on to the back porch and was now corned and clearly outnumbered by the two dogs. Grace –border collie at heart– had that possum cornered. Scruffy –running maniacally back and forth– was sounding the alarm. That possum looked horrible. It’s face was disfigured into a snarl. It might have been drooling. It was definitely hissing. We thought it might be rabid. Anyway, we brought the dogs inside, thinking that this would allow the possum the space to safely wander off into the night. While we are at it, we took a brief visit to “The Google,” to look up possum behavior. Frankly, given the way it looked, we were afraid this animal might have been rabid. Reassured by this, and since twenty or so minutes had passed, I stuck a flashlight through the sliding glass window, to see if the possum was still there. I figured, with the danger long gone, he’d probably seized the moment to wander off. To my complete surprise, not only was the possum still there in that corner of the porch, but it was in exactly the same position as it had been, twenty minutes before! Same snarled mouth. Same crazed look. As if the two dogs were still right in front of it, still threatening it’s life. I went back twenty minutes after this. Same thing! In exactly the same position, snarling out at the empty night. I finally went to bed, and we kept the dogs inside that night. Somewhere during overnight hours, the possum did wander off. But it’s clear the animal spent at least an hour, frozen in that same fear-response position, as if a long-gone threat was still immanent, pressing, and an immediate danger. I feel like that possum, I suppose. I guess I ought to just get up and wander off. But I’m frozen. Wondering. What does all this mean? What if the worst had happened? What if I had died? I mean, I am getting older. I turned fifty last September. I wrote about how that sucked. It still does. But I moved through that milestone, and just kept moving on. So then, holy crap, here’s an actual medical test that, no matter the result, reminds me of the truth I’m already living: I’m older. I’m gonna die some day. It’s not like I didn’t already know all that. But this test became an outward and visible manifestation of the inward and spiritual reality. So, yes, getting older is a part of it. But, so too is just thinking about the past few months. Starting with Holy Week, I worked a string of about forty straight days without a full day off. I am not bragging. I am reporting/confessing. Funerals. Other extra events. Just regular church stuff. But it’s not balanced. It’s not what I “preach” to others all the time. It’s not “keeping Sabbath.” I get that. I preach about keeping things in balance. I sit with folks in my office and tell them how they ought to do it. I talk (sometimes I probably brag) about my hobbies and interests, and the great and busy life Dennise and me have. Or, is a “good tired” ever a good thing, beyond a rare occurrence, now and then? It’s theoretical. I get that. But I’m afraid the answer would be, “No.” That’s what’s coming to me, at least. Sure, a lot of what I did, I’d do again. In….ahem…a heartbeat. But all of it? Would I work all those days in a row, or would I find the way to take some time off? For example, I can’t recall when I last picked up my guitar and just played for a day. Or even a few hours. When was the last time I wrote a song? Yes, I get away to ride my bike pretty regularly. But even during a lot of these rides, as I’m peddling away, my mind is already on whatever-comes-next…worried that I won’t make the next thing; failing to even see the beauty of the lake. I’ve always taken these as compliments. But maybe it’s not really a compliment or a shield. My life has an “extra-beat.” Life is a song in 4/4 time, and I’m always cramming-in just one extra downbeat. 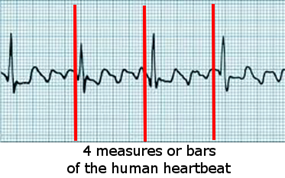 A fifth beat in the measure, that makes the rhythm a little….bit….off. Because this is what they’re telling me about my heart too. It’s not beating too fast, or too slow. But, there’s an extra beat in the rhythm. So, the next question, for me is: what to do about it. Or, existentially, probably not do. But I don’t need a cardiologist to tell me what’s causing the extra-beats in life. I can pretty easily identify that. The question is: Do I cut something out? Or, When it’s all good, what do/can you cut? What would a regular life-beat look like? I don’t come here tonight with answers, but simply a willingness to hold the questions before me in tension.